Tooth loss affects our day-to-day lives in so many ways. It impacts what we can eat and when, how we speak, and even how others think of us. It’s not an easy condition to live with and it affects almost half of Americans. 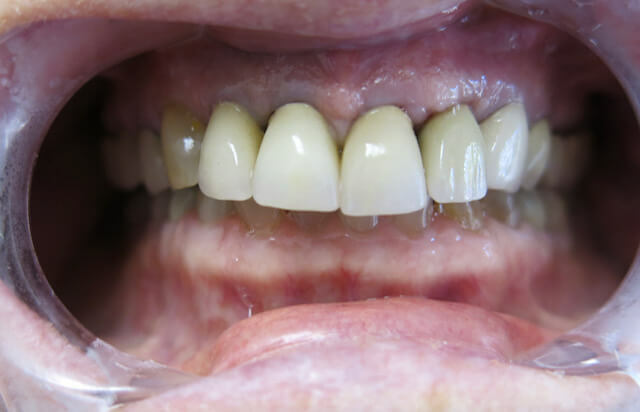 Dental implants provide a long-term solution that comes closer than any other treatment to restoring not just the aesthetics of the tooth, but the functionality as well. An implant can protect your jawbone and provide the restoration with the strength and support of a natural root. In fact, your body accepts it as organic and anchors it in place with natural bone tissue. Dental implants take away from the frustrations of dentures because they don’t slip or fall out. Instead, implants are placed along the jaw and held in place by the body, which accepts the implant as if it were a natural tooth root, generating bone that weaves through the implant and holds it tightly in place. Your experience at our Las Cruces implant dentistry starts with a consultation. 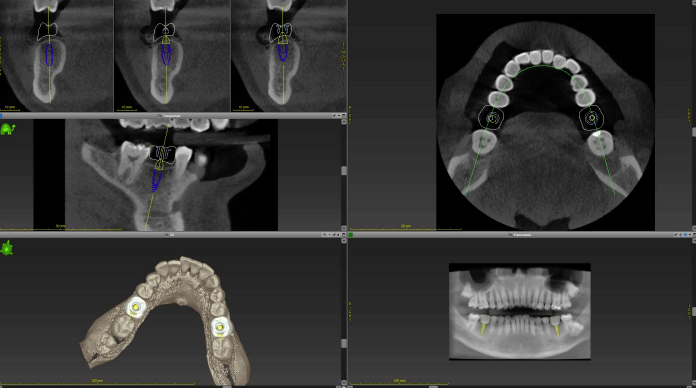 Using an i-CAT CBCT machine, we’ll get a complete 3D digital impression of your mouth. This impression gives us a comprehensive look at the density and volume of the bone, the site of the missing tooth, and the nearby nerves, allowing us to optimally plan your treatment for stronger, longer-lasting results. 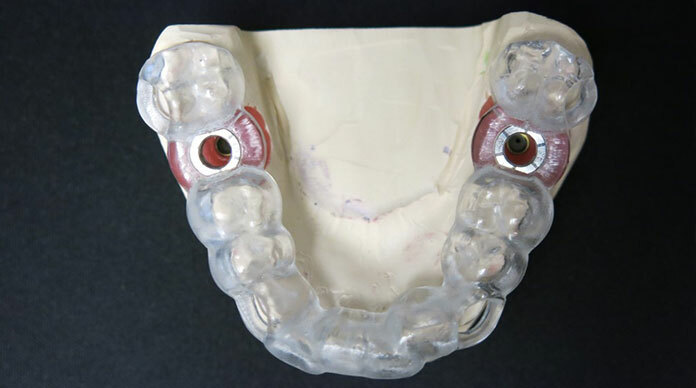 We replicate this digital impression with a physical model to achieve greater accuracy and precision. We take digital impressions to make for greater precision and accuracy in the results. 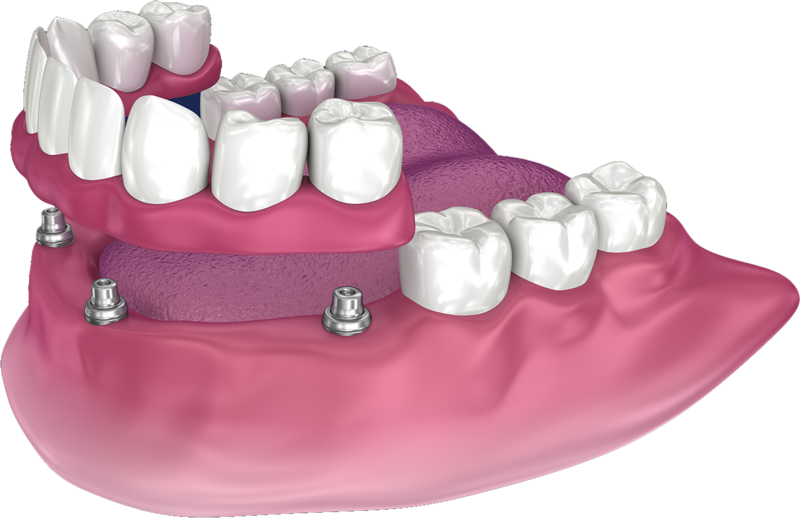 A guide is fabricated by the labaratory that aids in placing the implant in the same position as planned digitally. Once you’ve decided on the right treatment plan, you’ll come back to our office for the surgery. Depending on your oral health needs and your treatment plan, we’ll place the implants along the jaw during a single visit. In the case of immediate-load implants, we’ll provide you with a temporary crown or bridge that will be attached to the implant fixture on the very same day. The benefits of implants derive in large part due to the way they integrate with the jawbone, as if they were natural tooth roots. This occurs during a process known as osseointegration, which involves your jawbone naturally and organically producing new bone tissue which wraps around and anchors the implant fixture in place. 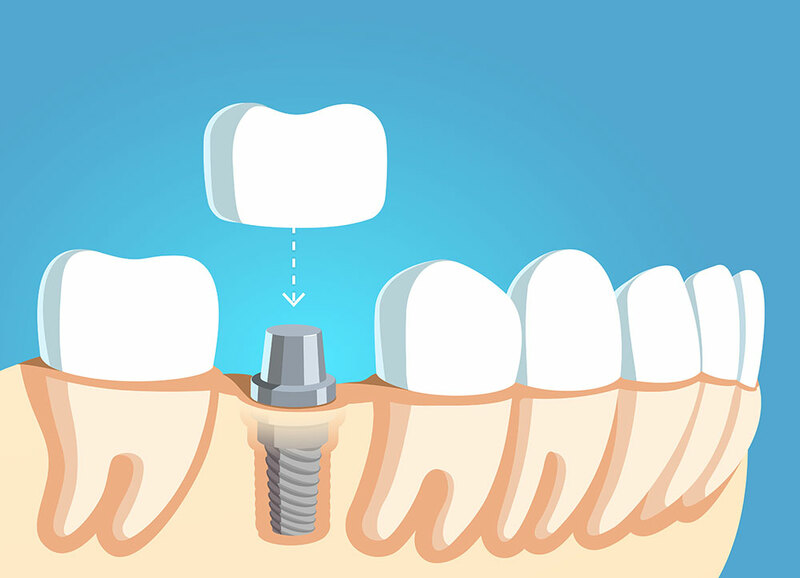 Once the area of the surgery has fully healed, you’ll come back to us for another visit so that we can place the abutments that connect the implant fixture and your new permanent crowns. With the implant fixtures anchored in place and the surgery site healed, you’re ready to receive your permanent restorations. Made from porcelain ceramic, your new teeth are remarkably durable and look absolutely stunning, just like real teeth. And unlike dentures, these crowns will never move or slip. In fact, you’ll hardly remember you were missing teeth in the first place. You’ll first try in your new crowns and we’ll adjust their size, color, and shape as needed so that they can seamlessly blend into your new, beautiful smile. Implants integrate with the jawbone through a process known as osseointegration, into which we go into greater depth further down the page. 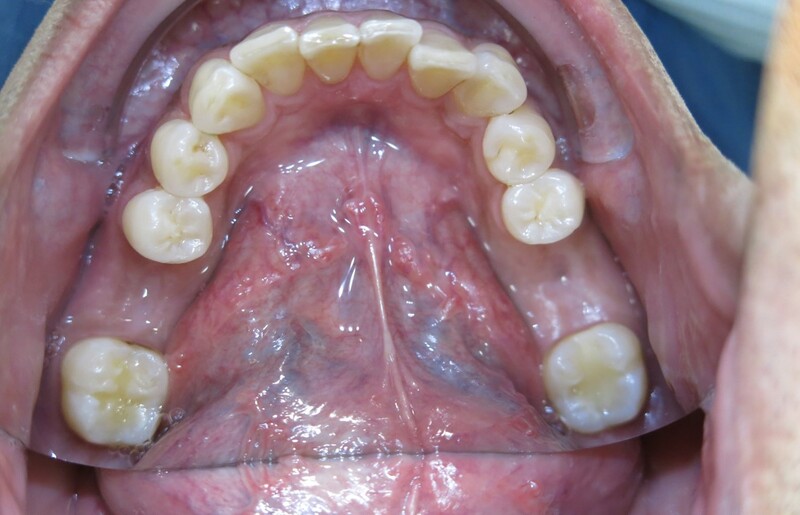 Traditionally, the area of the implant is left uncovered by a dental crown until the surgery site heals. Same-day implants allow you to walk out of our office on the day of the surgery with a temporary dental crown that looks and feels organic and natural. Candidacy for the treatment must be determined during an initial consultation. While same-day implants allow you to walk out with a crown on the same day as the surgery, this does come with risks as undue pressure on, or movement of, the implant can cause it to fail. Do your dentures slip and slide? Is your jawline beginning to appear sunken? 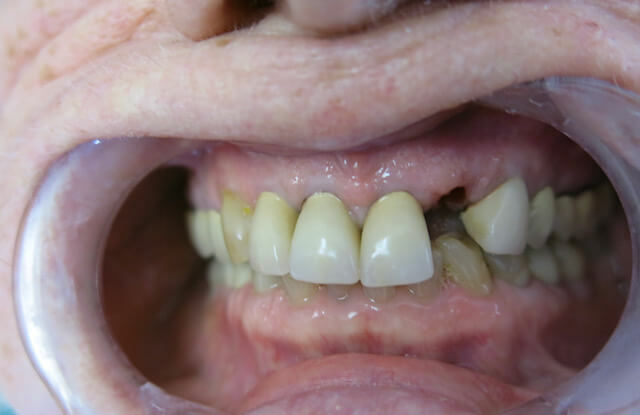 Loose and ill-fitting removable dentures are uncomfortable and aren’t doing your oral health any favors. Likewise, they can slur or impair your speech, restrict what you can eat, and cause the jawbone to weaken. 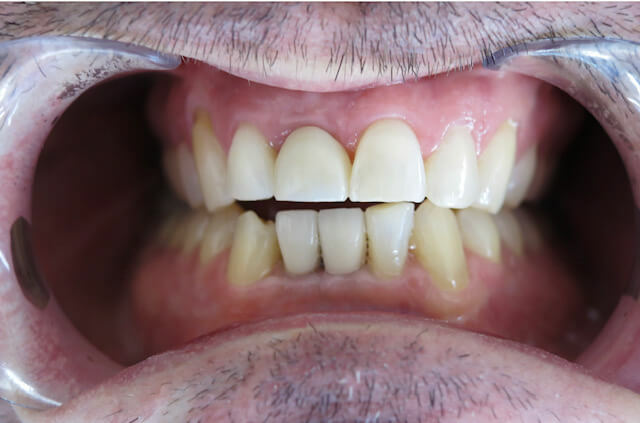 A hybrid, or snap-on, denture, also commonly referred to as an overdenture, offers the flexibility of removable dentures with the strength, robustness, and longevity of dental implants. 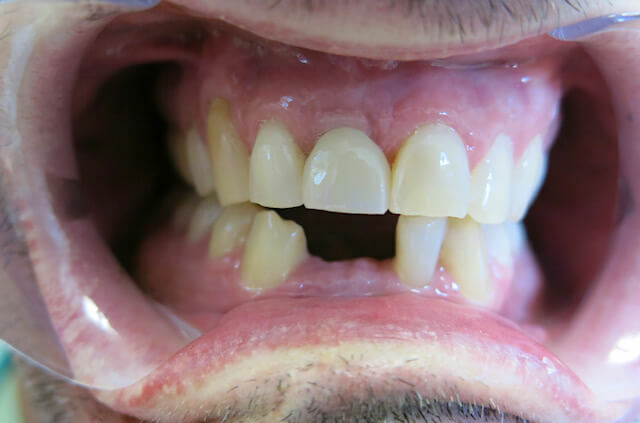 Using implants to anchor the dentures into place along the jaw, these dentures firmly “snap” into place, providing a greater rate of functionality and comfort. Furthermore, because they use dental implants to remain in place, hybrid dentures help restore your jawbone’s health and prevent premature wrinkling around the jawline. Most people suffer from dental anxiety to one degree or another. It’s a perfectly reasonable feeling and there are solutions that can make the procedure more comfortable. We offer nitrous oxide and oral conscious sedation. Nitrous oxide, or laughing gas, works by combining a sedative with oxygen and delivering it through a mask. Oral conscious sedation is typically delivered in the form of a pill. Both are safe and effective options. While sedated, you’ll still be awake and able to respond to the dentist. You’ll simply feel more relaxed and at ease while we perform the treatment. Dental sedation is an especially fantastic option for patients who require multiple procedures, since it allows us to perform more work in the same day, reducing the total number of dental visits you’ll make to our office. Dental implants function exactly like your natural teeth. You never have to worry about taking special care of them or finding some special solution to soak them in. If you’ve spent several years without teeth you’ll come out of the implant procedure feeling like a new, more confident person. Caring for dental implants is simple. You brush twice a day, floss daily, and go for cleanings every six months. Should you decide to get implants, it’s important to follow a healthy diet that is limited in sugar so that surrounding teeth, bone, and gums don’t decay. The ideal candidate for dental implants will be healthy and have any pre-existing issues, such as periodontal disease, addressed before surgery. The only way to find out if you’re a candidate is to schedule an appointment with Dr. Borham. Some dental insurances provide partial coverage for some parts of the implant and some don’t. We are providers for multiple dental insurances. For more information call our office.